Sometimes being a fanboy will drive you pick up albums you'd never otherwise own. 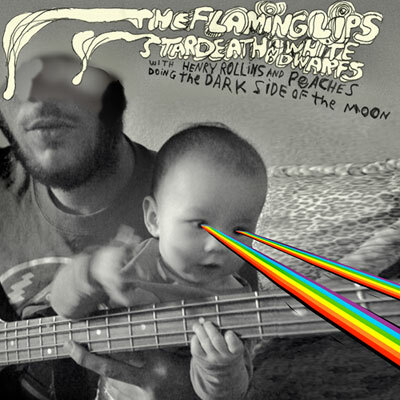 I picked up a copy of The Flaming Lips' long title, The Flaming Lips and Stardeath and White Dwarfs with Henry Rollins and Peaches Doing The Dark Side of the Moon because, well, Henry Rollins' names was in the title. Plus, knowing the disdain that Rollins has for Pink Floyd, I was curious as to why he'd partake in such a venture, let alone how he'd contribute. Well, turns out Rollins was the one to read the album's original interview snippets, plus deliver the lunatic's laughter in "Brain Damage." Makes sense. Otherwise, Wayne Coyne recruited his nephew Dennis Coyne's band, Stardeath and White Dwarfs to aid in the Lips' mission, and possibly just to create a project they could to together. Very Frank and Moon Unit. The undertaking of recreating a classic album is a pretentious one at that, so it's important to either make your parody known, or make your homage genuine. In the case of this album, I can't tell what they're doing. Is it serious? Is it humorous? Is it hubris? I think in the case of Wayne Coyne, as usually seems to be the case with Wayne Coyne, it's a bit of everything. The guy always comes off the well-intentioned self-deprecating bandit, pitting cleverness and acid bath imagination against his likable disposition. It's hard to know if the guy is ever genuine because he tends to try mightily to be weirdo. But, to do something like this, and get away with it, certainly you must have some sense of your dominance and some security in knowing that your fanbase will forgive your every misdeed. Coyne is on sacred ground, but at least it's ground laden with classic rock and, if I remember correctly, weren't the 90s mostly an unapologetic middle-finger to the quote/unquote hope of the hippies-turned-disillusionment and excess-turned-plasticity of the Reagan era and its ill-gotten gain? If Coyne still carries a torch for his place in rock history, a 90s take on a psychedelic throwback, then this may be the most appropriate cover album ever made. Having said that, credible, necessary, or not, the Lips' version of "Money" was a disappointment.